A stunning new retirement village which is due to open in the summer of 2019 has benefitted from a series of rooflight solutions from leading manufacturer Xtralite. 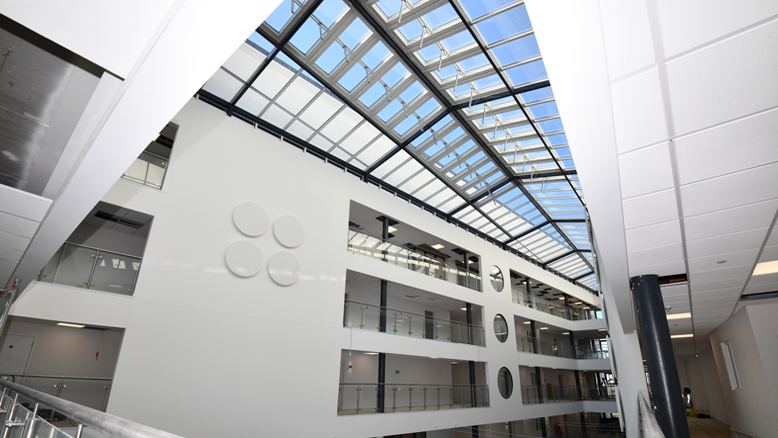 The Village Centre roof itself benefitted from argon filled double glazed panels and was thermally enhanced to elevate the comfort of users in the central atrium of the village, the location of health spa, bar, gym and other communal facilities. Its design is visually striking creating a focal point merging visual aesthetics and practicality. This area also had smoke vents fitted to meet smoke ventilation building regulations. Both were sizeable installations measuring over 40m in length and up to 12m in width highlighting how X-Span is entirely versatile and can encompass varieties of style, design and ventilation to fulfil both aesthetic, safety and ventilation demands and legal requirements. Finally, the self-supporting trapezium styled entrance canopy had single glazed panels from the X-Span range creating a striking visual effect upon arrival at the village. X-Span remains a popular choice of glazing system. Capable of utilising glass, or lightweight lumira and polycarbonate. In the case of Wixams, glass was used for its clarity and far superior sound attenuation. Further information can be found by visiting www.xtralite.co.uk or by calling 01670 354 157.